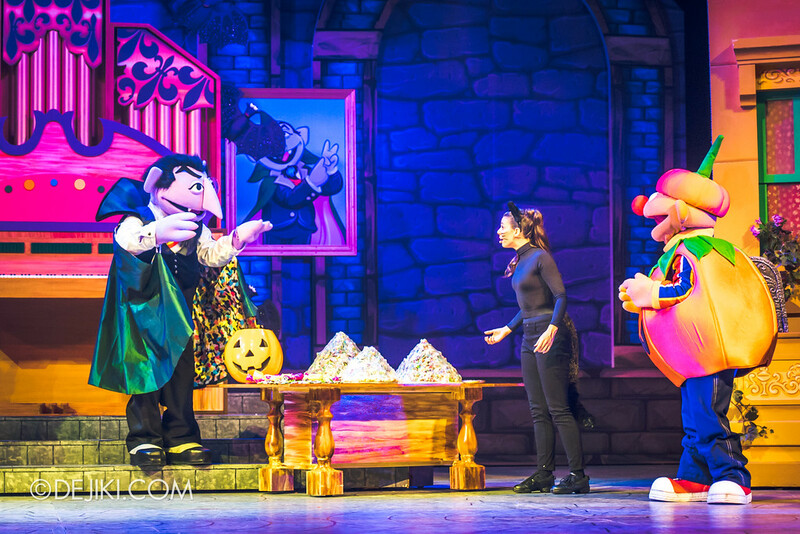 Trick or Treat is original show created by Universal Studios Singapore for the park’s daytime programming for Halloween. 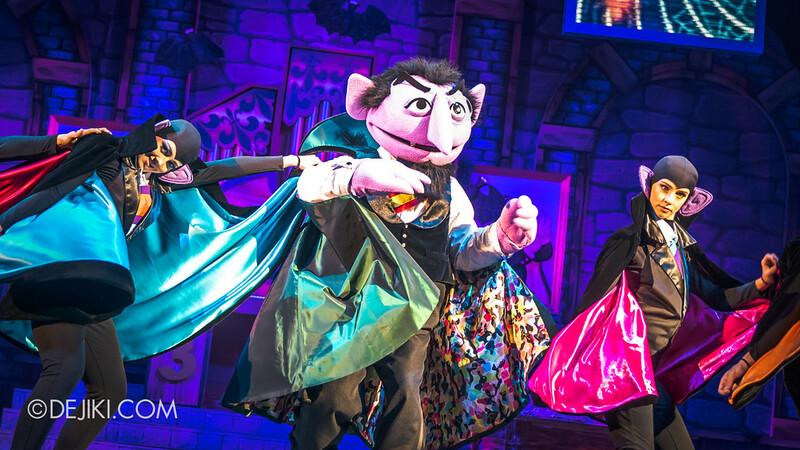 It introduces Count Von Count (The Count) to Singapore as a stage character. He has appeared in the Spaghetti Space Chase ride. 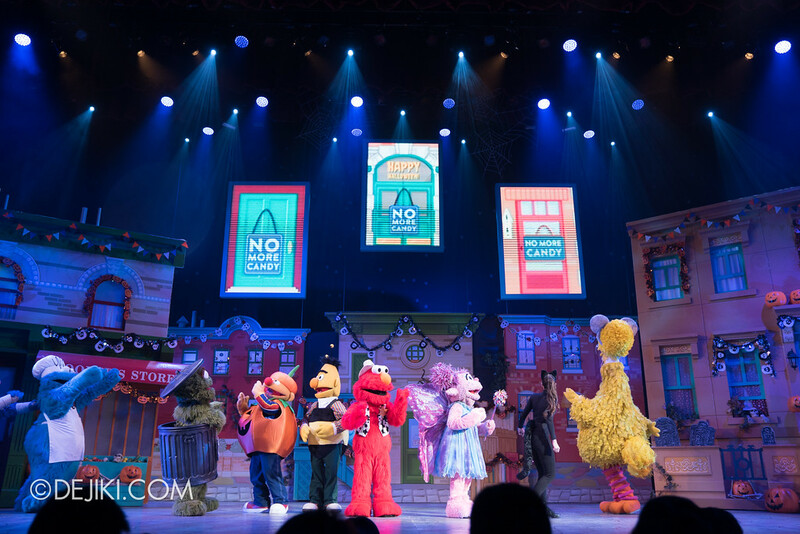 After the closure of Sesame Street – When I Grow Up show, I’m sure most would not expect that the park would do another Sesame Street show. 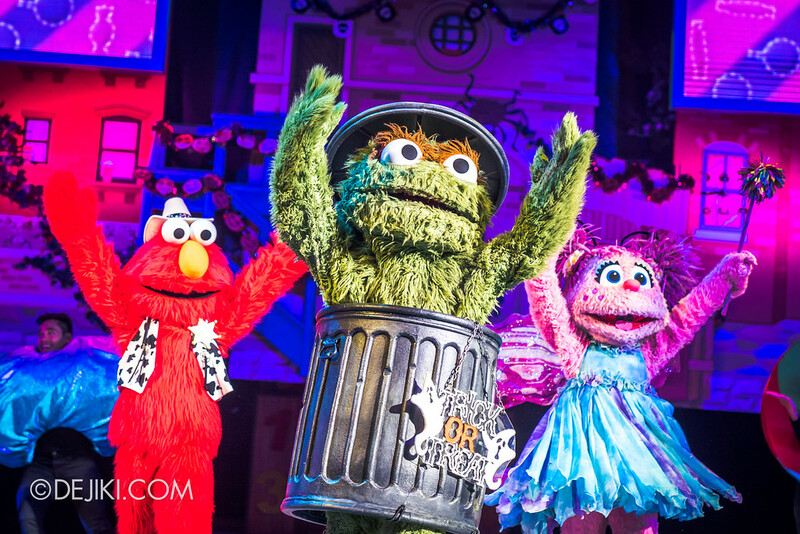 When I grow Up was an upgraded version of a Street Show, and it wasn’t spectacular compared to the seasonal shows starring Sesame Street characters, or the award-winning Sesame Street Saves Christmas show. 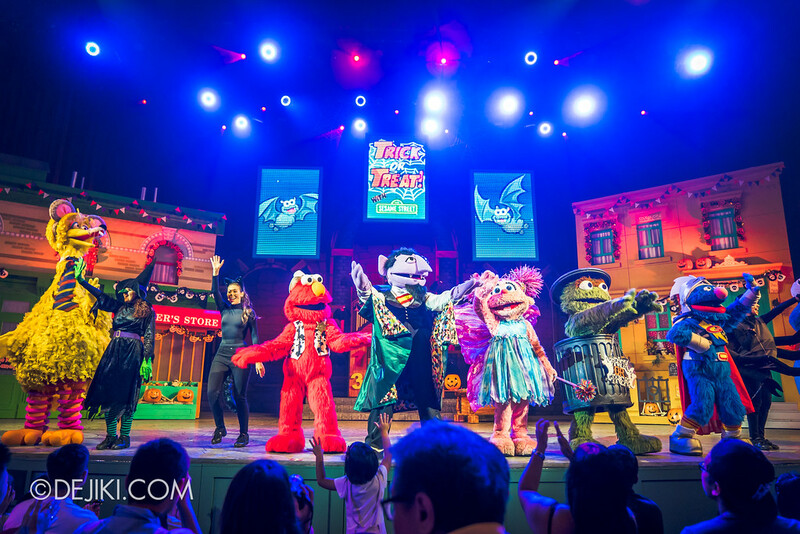 This Halloween-themed show has Sesame Street’s trademark humour and storyline: Sesame Street friends are celebrating Halloween. 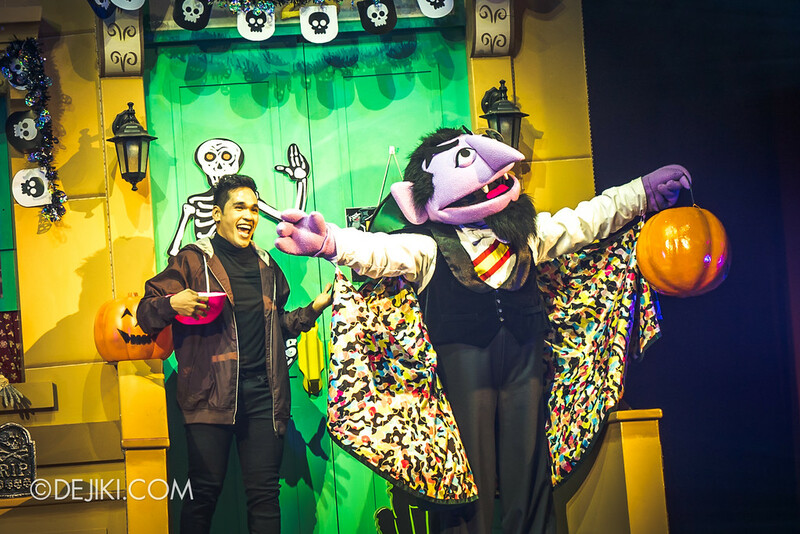 They tried to scare Oscar with a story of Pumpkin Jack when he wasn’t convinced about going Trick-or-Treating. 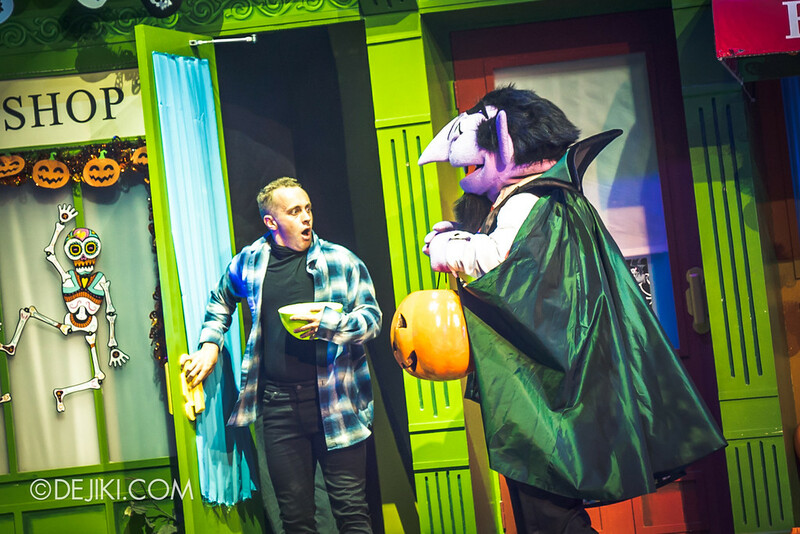 Then, The Count, obsessed with counting, visits Sesame Street and accidentally collects all the candy. 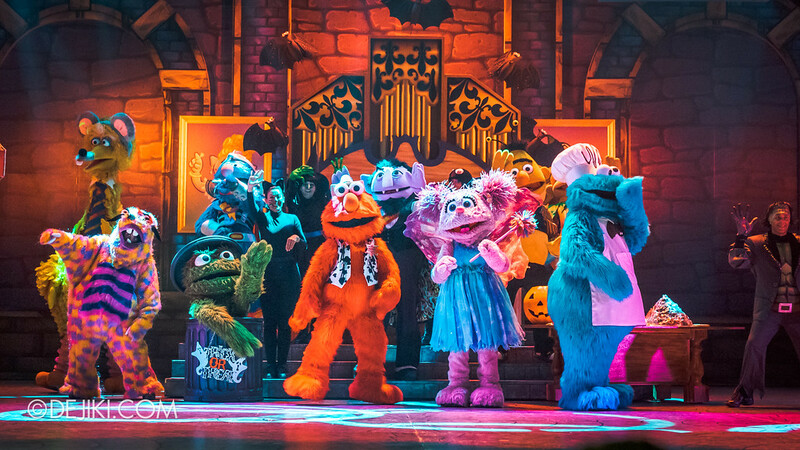 This leads the Sesame Street gang to visit his Castle – yes, everyone went there together – and the result is hilarious. 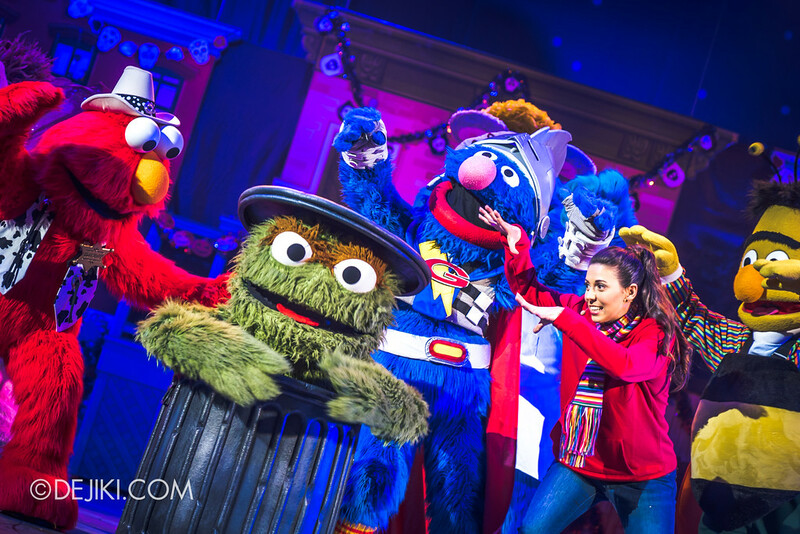 In between the scenes are some meta moments where Elmo interacts with the unseen Narrator. 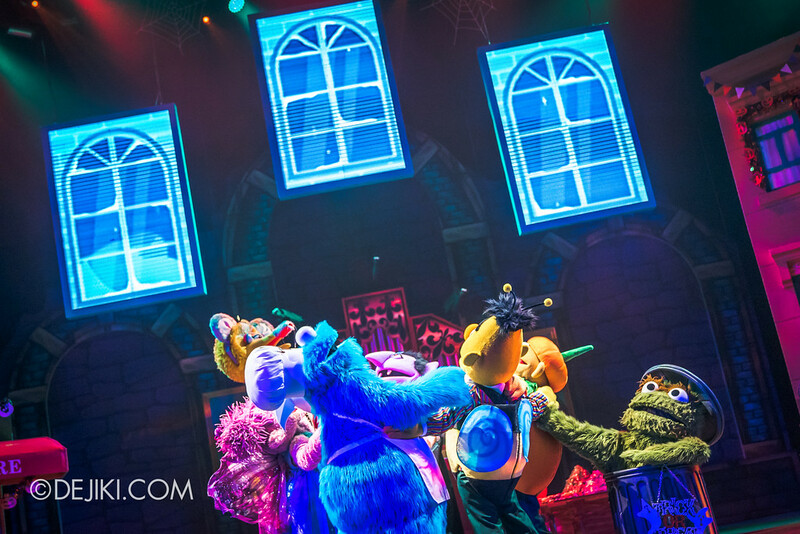 Even some sound effects from Monster Rock were heard, paying homage to the original show that ended its run at this very theatre, three years ago. There are mysteriously generous people at Sesame Street. 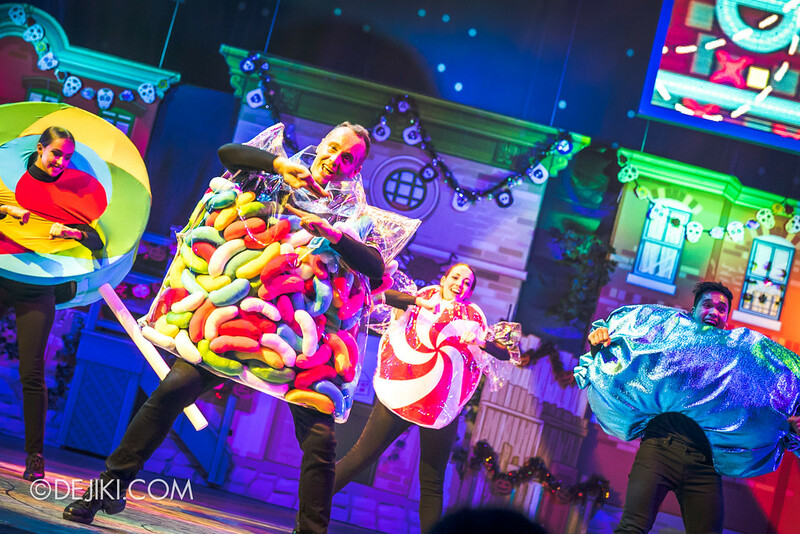 Sweet dreams are made of this – I hope not. I enjoyed the show, and this is coming from someone who has queued and sat through lengthy (overly cutesy) shows in Disney Parks for the sake of analysis and review. It’s easy to explain why: This new show succeeded in areas that When I Grow Up did very poorly. It’s a brisk 20 minute story. Good pacing. The characters didn’t have long, whiny lines. Their trademark personalities are succinctly weaved in. Elmo’s grown up. The songs are not annoying. There are 4 dancers to keep the stage alive. Costume changes. Stage transitions that were simple yet effective. 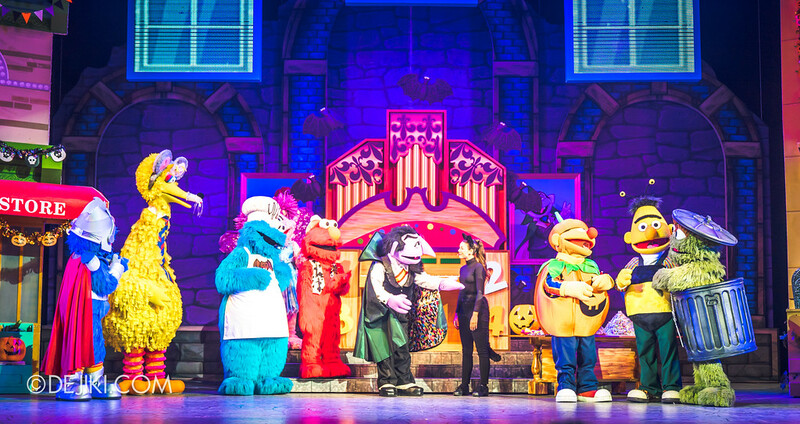 So in the end I’d say: Trick or Treat is an entertaining show for guests of all ages – yes, even adults. Gone are the park guests who would sneak off halfway or doze off. 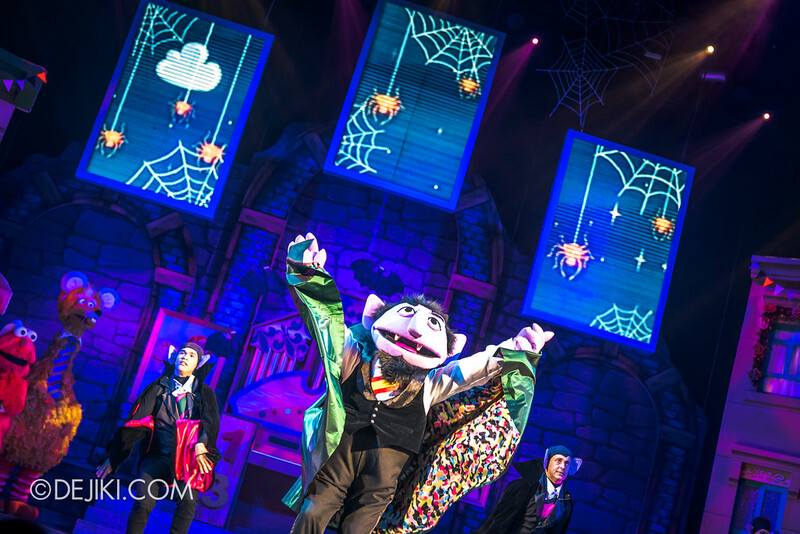 You have about two months to catch it before The Count leaves! Have a look at more photos from the show. Let me know what you think if you have watched it. 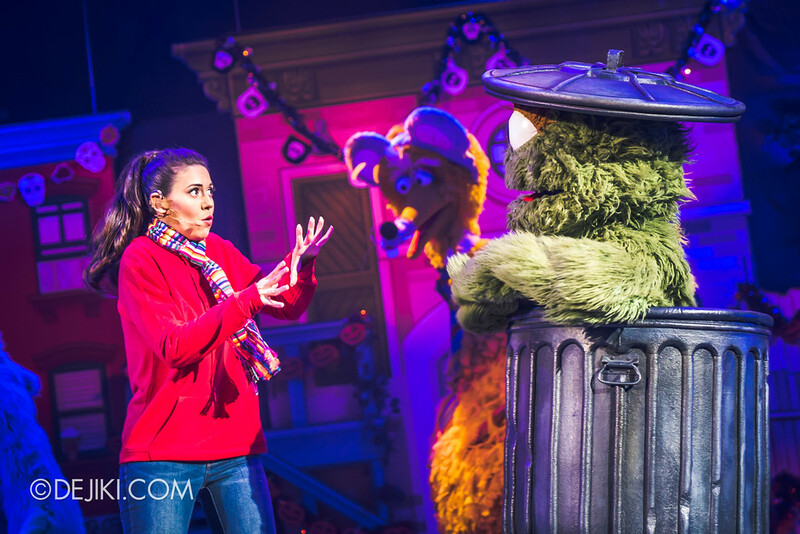 Elmo demonstrates the power of bending reality in this show – many times. Multiple shows daily. 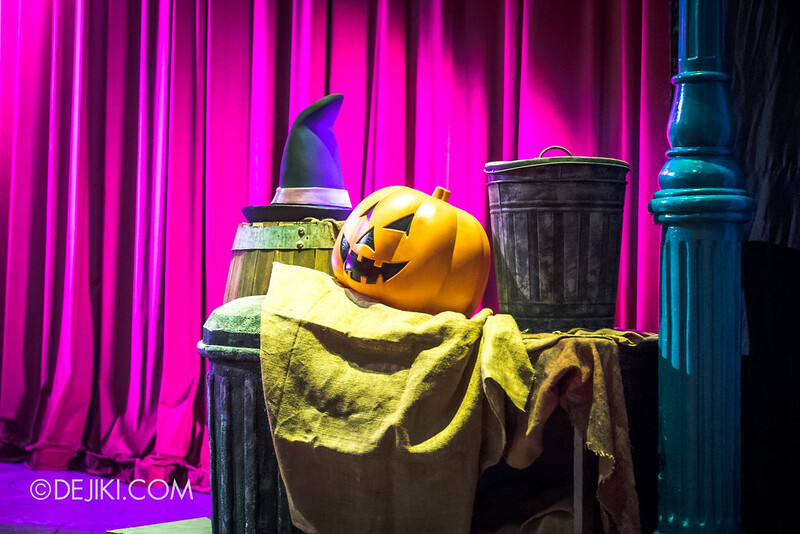 Check in the park for show times. 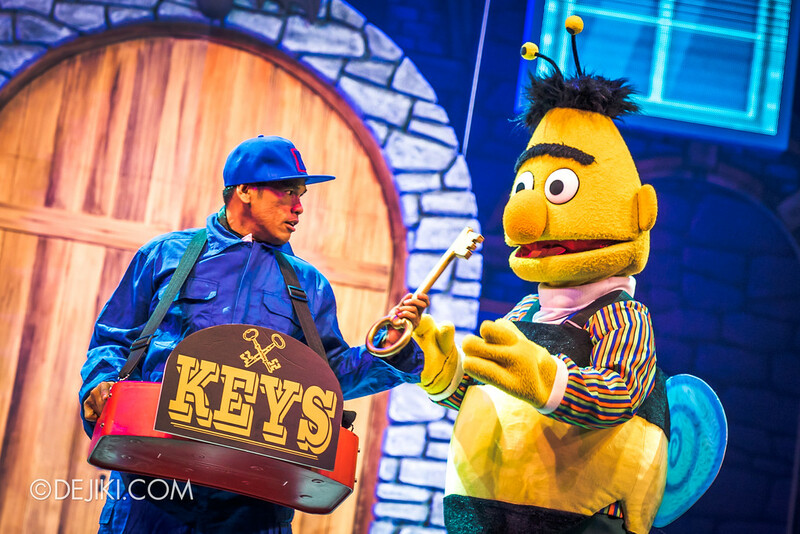 This attraction is included in the regular day-time admission and can be enjoyed by all guests during the day. 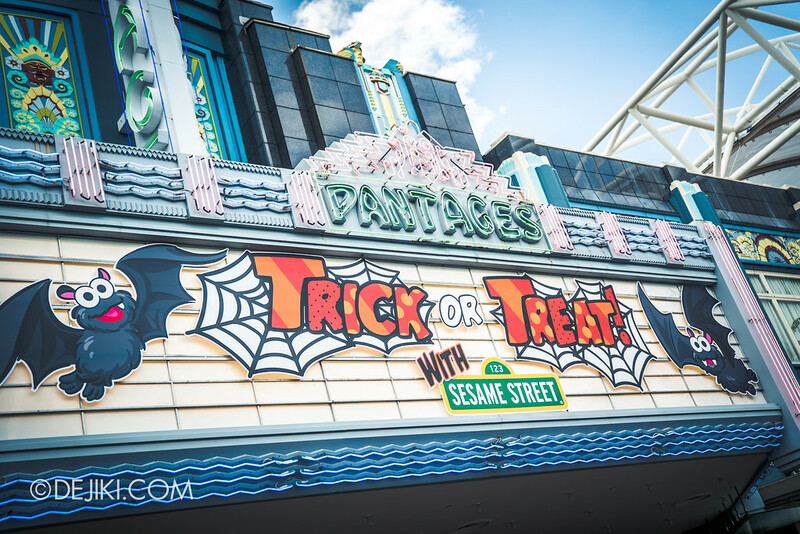 Trick or Treat is not part of Halloween Horror Nights 7. 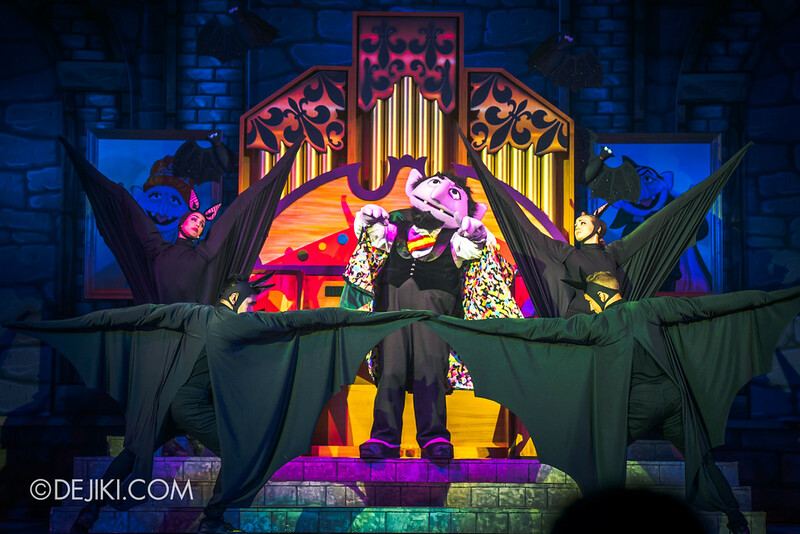 Another show, The Laboratorium will be performed during Halloween Horror Nights 7 event nights.